TORONTO, Thursday, April 19, 2018 – How does an institution like York University become one of Canada’s Greenest Employers for the sixth consecutive time? By reducing annual electrical consumption by 34,730,786 kWh, saving $5M in utilities every year, and recycling 3,705,780 kg of waste, for starters. In the 11 years since the Canada’s Greenest Employers competition began, York has landed on the list of Canada’s Top 100 Employers for sustainability initiatives more than half the time. York is one of only eight out of close to 100 universities across Canada to win a spot at the top. As a leader in sustainability, the University has embarked on several environmentally friendly initiatives that alter the footprint of campus buildings, such as five green roofs, the use of PV solar panels, the collection of rainwater, a solar powered electric vehicle charging station, and the LEED Gold certified Bergeron Centre for Engineering Excellence. Three more buildings are also LEED certified. Water refill stations across the University replaced disposable water bottles. 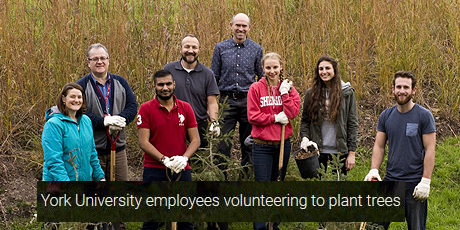 For more, read the York University Sustainability Report. Canada’s Greenest Employers is part of the Canada's Top 100 Employers project managed by Mediacorp Canada Inc. Learn more about the full list of winners.